Sensing Master Splinter’s despair at his new life as a rat, the Turtles agree to use the small amount of Mutagen that they have left to concoct a formula that will revert Splinter back into Yoshi. The experiment is a success and Yoshi decides to take a stroll, as a human, through the city. Meanwhile, April is reporting Public Service Announcements from the local library when she spies Rocksteady and Bebop. April immediately contacts the Turtles, who are depressed by the possibility that Master Splinter/Yoshi may never return and jump at the chance to divert their attention. Besides, they suspect that Shredder must be nearby. The TMNT head straight for the Library, and sure enough, encounter Shredder and company, who of course, escape. However, they leave a clue behind. It seems that Shredder has stumbled onto a spell that will enable him to open a portal to any dimension he chooses. The Turtles find a reference to a temple in an old subway terminal somewhere under the city that acts as a nexus – a point where many dimensions intersect. Now, all the heroes have to do is find it before Shredder does. Meanwhile, while enjoying a walk through Central Park, Yoshi experiences the affects of the Mutagen spray wearing off which causes him to revert back into Splinter. Yoshi races back to the Turtles’ lair, but along the way, he is pursued by the cops and a frightened mob. Back to Shredder as he nears the location of the underground Temple and contacts Krang to send him the NeuroScrambler he designed to pit mutant against mutant. Shredder plans to use it to distract the Turtles while he opens the portal to Dimension X. Elsewhere in the subway tunnels, the Turtles, feeling the effects of Shredder’s NeuroScrambler, square off against each other while April looks on helplessly. Before the TMNT can kill each other, April finds the NeuroScrambler and destroys it. 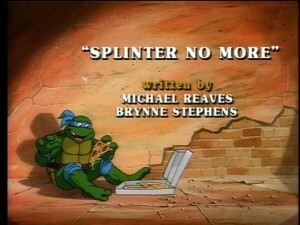 April and the Turtles continue on and find Shredder reciting the magic spell. In their effort to stop him, the heroes are subdued by Rocksteady and Bebop. Shredder continues, but is interrupted by Master Splinter, who is now fully reverted to his rat form, causing the magic spell to be “misspoken.” And, as warned by Krang, a portal to another more dangerous dimension is opened, releasing a viscous one-eyed tentacled monster. Within moments the portal closes and the monster is unable to return to its own dimension. The only solution is to destroy the Temple with the Monster in it. The Turtles and Splinter succeed, but, you guessed it, Shredder, Rocksteady and Bebop escape.